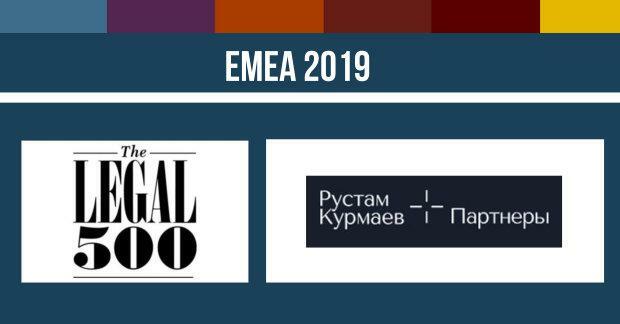 The international legal directory The Legal 500 has published the results of its annual survey of the legal services market in Russia. Rustam Kurmaev and Partners is noted among the leaders in the fields of dispute resolution, white collar crime and restructuring & insolvency. The firm’s partners Rustam Kurmaev, Dmitry Gorbunov and Dmitry Kletochkin received individual recognition in the editorial. For Dispute resolution: Litigation the firm is ranked in Tier 4 with the accompanying description: "Disputes boutique Rustam Kurmaev & Partners is praised for its ‘expertise and dedication’ and is rapidly building a reputation as a ‘go to’ firm for high-value insurance, commercial and construction disputes. Name partner Rustam Kurmaev ‘is one of the best trial attorneys in Russia, whose understanding of the client’s business and his commercial awareness is second to none’; he successfully represented Mechel in an appeal before the Commercial Court of the North Caucuses Circuit concerning the award of $282m to Rostov Electrometallurgical Plant. Dmitry Kletochkin, who is ‘a top-notch expert with an impressive track record of cases’, acted for an electronics manufacturer in an insurance claim worth over $7m." For Restructuring & Insolvency the firm is ranked in Tier 4 with the following description: "Rustam Kurmaev & Partners acts for debtors and creditors in insolvency disputes. Name partner Rustam Kurmaev and `top-notch bankruptcy expert` Dmitry Kletochkin are representing the interests of Mechel, and its beneficiary, in ongoing proceedings brought by the general director of Rostov Electrometallurgical Plant concerning subsidiary liability in the amount of $179m; the claims were dismissed at first instance. Other clients include Volkswagen Group, Yamaha Motors and Toyota Bank." For White collar crime the firm is ranked in Tier 3 with the following description: "Boutique firm Rustam Kurmaev & Partners has a strong offering in white-collar criminal defence work. Managing partner Rustam Kurmaev, whose `advice is always timely and strategically impeccable`, successfully defended the senior management of the Chelyabinsk Pipe-Rolling Plant against criminal charges and allegations of unlawful pressure before the Moscow City Court. Dmitry Gorbunov, who is `a skilful and effective white-collar crime heavyweight` practitioner, obtained a criminal liability dismissal for the manager of a global manufacturer following an escalator accident at a shopping centre in Podolsky district. Dmitry Kletochkin regularly supports Kurmaev and Gorbunov in disputes involving state investigative authorities." In addition to that RKP has launched its own microsite on The Legal 500 website featuring the firm’s detailed profile with the description of its practice areas and expertise, an interview with the managing partner Rustam Kurmaev and client testimonials. For 32 years, The Legal 500 has been analysing the capabilities of law firms across the world, with a comprehensive research programme revised and updated every year to bring the most up-to-date vision of the global legal market. Today The Legal 500 assesses the strengths of law firms in over 150 jurisdictions across the globe.